Young ladies in tennis have always been judged on how they look and it is still the reality. It is better than 10 and 20 years ago but it still has a long way to go. The history books will show that last weekend the Carlton Blues defeated the Western Bulldogs, narrowly as it happens, to top their conference in the AFLW - the women's Aussie rules league which is now more familiar to us on this side of the world thanks to the exploits of Cora Staunton, Ailish Considine and Sarah Rowe. The Blues had to dig deep to hold off a fightback by the Bulldogs in the last quarter to win by three points. The game, though, will be remembered for a controversy which developed in the days after it. Carlton's first goal was scored by Tayla Harris and the moment was captured in a brilliant photograph by Michael Wilson and later posted on social media. Then it started. Writing for The Guardian, Kasey Symons noted "the vile commentary" which ensued. Tayla Harris has since described some of those comments as "sexual abuse". But by the time she gave a radio interview, the comments - and the photograph - had been taken down by Channel 7, who had posted the picture on its AFL Facebook page. Last week’s tweet by Tayla Harris. For all the progress in attitudes to women in sport the fact that the initial response was to remove the picture and the vile commentary, as opposed to just the latter, shows just how far there is to travel on this road. If the picture had been of a man kicking a goal rather than Tayla Harris, what would have happened? From now on, when Tayla Harris is taking a kick at goal, does she need to think about more than just her technique? Is that the message here? Harris has a distinctive style, and it is perfectly captured in the picture, but censoring it was an implicit criticism of the player and her style. It was not, though, a criticism of her as a professional athlete. Instead, it cast this part of her completely aside. Harris was judged on her appearance, and not as an elite athlete. It reinforced the perception that women must be conscious of their image in sport, rather than having the power to make it their own choice. And this matters. And if you take away the choice, then it is a barrier, an obstacle for entry into sport for young girls. In a revealing interview in the Daily Telegraph on Friday, Monica Seles spoke frankly to journalist Kate Rowan about her eating disorder and how she had been crushed by the pressure of always feeling the need to look good. She said: "So much of tennis is about body image, about sponsorships and endorsements and how you look. When I gained a lot of weight, I realised people just looked at me kind of like, 'How could she do that to herself?'" A few weeks ago, three students from a secondary school in Co Cavan won the top prize at this year's PE Xpo, a national competition set up to encourage teenagers to research and study PE-related topics. This year over 200 schools entered and exhibited at DCU. 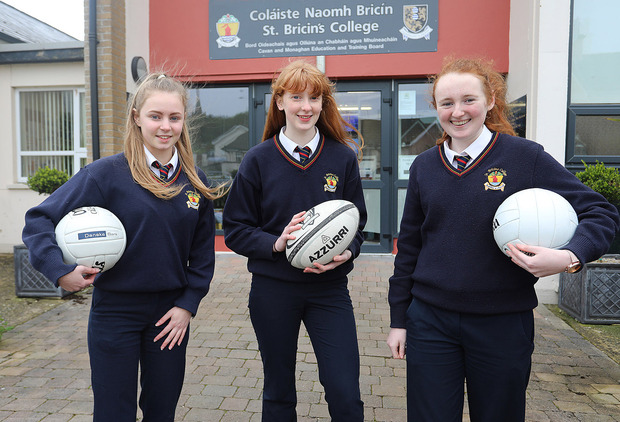 The winning project, by Aisling Flood, Nadine O'Brien and Tara Hegarty from St Bricin's College in Belturbet, was a study on the perception of body image and well-being in sportswomen, at elite and grassroots level. At the core of the project was a detailed survey of 421 women, and the participants came from a broad range - including members of the Irish women's rugby and hockey teams, camogie and Gaelic footballers, models, bloggers and students. Unsurprisingly, the girls' findings bear out the view that body image is an issue in society. And it is impacting in trying to get women active. The idea came to the girls after winning a Gaelic football final last year. Looking at the team photograph they noticed that all of the team were wearing fake tan. The girls wrote: "The female body image and what a person should or could look like is a controversial issue. There are some very direct messages associated with body image in the media. The media bombard women with images of celebrities, sportswomen, and models, all with the so-called 'perfect body'. For a lot of women, having this 'perfect' body is a very real aspiration. An article by Elizabeth Heubeck, from WEBMD archives, states that, 'Women who look beautiful by modern American standards and appear happy, many girls view them as role models'." Some of the findings: only four of the women surveyed said they were completely comfortable with the way they look; 55 per cent admitted that the size or shape of their body had prevented them from taking part in a sport; and 42 per cent said they had enhanced their appearance in some way (putting on make-up, getting their hair done, wearing fake tan, and so on) before competing in sport or going to the gym. Furthermore, over half of the women admitted their most common body image concern was their own perception of how they looked, while 27 per cent said they felt insecure around other people because of how they looked. More girls drop out of sport in their teenage years than boys and the pattern continues into adulthood. The odds are more stacked against females becoming involved in sport. These findings show the scale of the challenge to break down these barriers - and perceptions - and to entice more women to become physically active. James Sherry, PE teacher and deputy principal at St Bricin's, says the girls believe the range of available activities has been narrowed by these pressures and that serves only to increase drop-out. 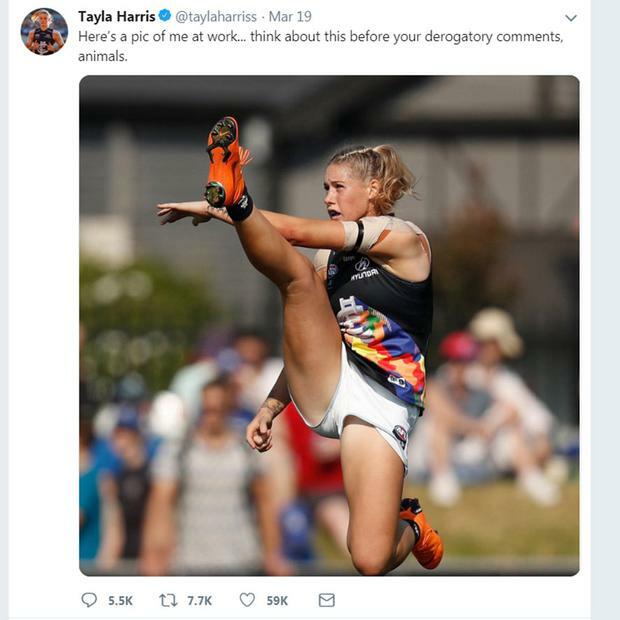 On Friday, meanwhile, Tayla Harris urged people to post a photo or video of themselves online recreating her kicking style. Yesterday, she was back on the pitch, kicking another goal, as Carlton Blues beat Fremantle by 36 points to qualify for the Grand Final.